Save Time and Money. Eliminate Risk. The following premium services are available with your Holiday Data Service® subscription. Copp Clark is the authoritative source for information on holiday observances affecting world financial markets. Our holiday reference data services are trusted and recognized globally as the market standard. 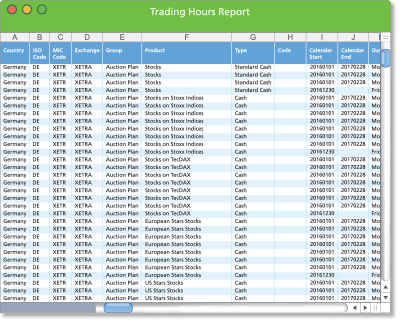 Trading Hours Report® provides confirmed electronic on-order-book trading hours for major global markets. Subscribers receive reliable data from the authoritative source for standard products and their exceptions. Updates are delivered monthly and include separate change reports for cash markets and derivatives. Email alerts are sent when significant changes occur between updates. Annual schedules for updates are delivered each November. 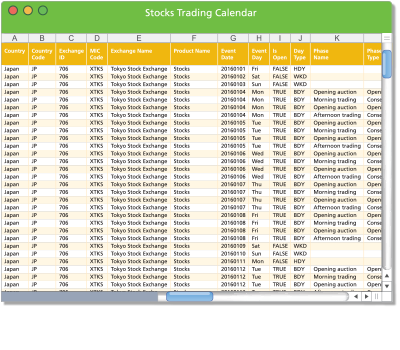 Stocks Trading Calendar provides two years of core trading hours for the main stocks traded on major markets. Includes the day-by-day trading status for each market, specifying weekends, holidays, half-days, and business days. 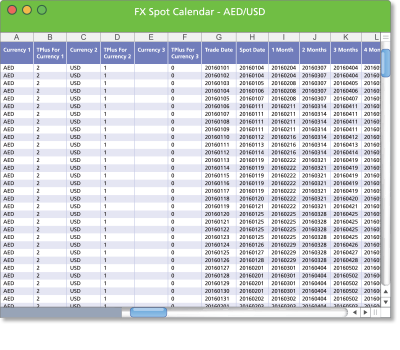 Trading hours are reported from opening call to closing call in local time. Updates to trading hours are delivered with Copp Clark’s market holidays updates. 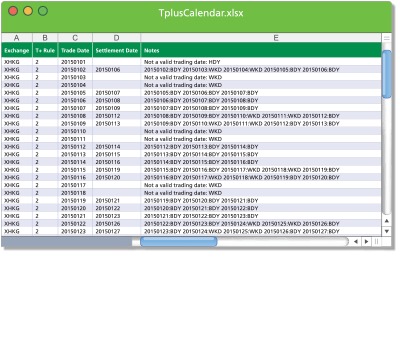 Tplus Exchange Settlement Calendar provides valid trade dates and corresponding settlement dates for world stock exchanges. Data is based on current Tplus settlement rules for regular equity trades, as provided by each exchange. Includes monthly forward FX dates for one year forward (determined in accordance with accepted international dealing ‘modified following’ protocol). Updated calendars are delivered whenever there are changes to holidays. A Leading Financial Markets Information and Technology Vendor.